Encaustic is a painting method in which pigment is added to molten wax and then applied to a surface. The technique requires fusing the layers of wax to prevent cracking. As a result, encaustic works are durable and will not melt at room temperature. 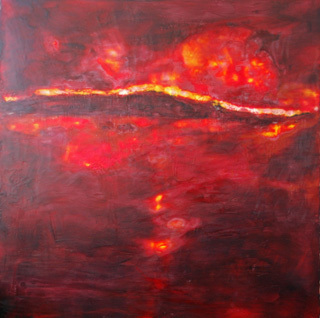 Encaustic is derived from the Greek word "enkaustikos" which means "to burn in". The ancient Greeks used wax as early as the 5th century B.C. for a variety of reasons, one of them being to fill cracks in ships. Encaustics developed as a painting medium when pigment was added to the wax. Most of what we know about the origins of wax as a medium was recorded by the Roman Historian Pliny who documented the variety of applications: painting of portraits, the colouring of marble, terra cotta and ivory. Unfortunately there is very little describing early techniques and materials. Funeral portraits at Fayum, 130 km (about 80 miles) southwest of Cairo, are the most evident historic remains of encaustic painting. While under the control of the Roman Empire, Egyptian death masks were painted on wood using the pigmented wax technique of encaustic. The Fayum portraits reflect the complex synthesis of the predominant Egyptian culture of that city and that of the elite Greek minority in the city at that time. Following the decline of the Roman Empire encaustic fell into disuse. Although the painting of icons in encaustic continued as late as the 12th century, eventually the technique became a lost art. Efforts to revive the art in the 18th and 19th century resulted in limited success because of the difficulties in re-discovering the method through which the original base material was made - and which could be replicated in a mode that was stable and would last without chipping. The riddle of the material base was largely resolved by the American artist Jasper Johns during the 1950s and the success of Jasper Johns - one of his best known pieces being a rendering of the flag of the United States using encaustic (Flag, 1954-55) - encouraged its use as an accessible and popular medium. Earlier, the Mexican artist Diego Rivera had also experimented with encaustics in undertaking his monumental wall paintings. More recently - Tony Scherman and Joanne Mattera have shown encaustic painting to be a medium that enables artists to create a wide variety of subject matter. It has a texture that permits fine grained patterns but, at the same time, retains a visual depth that is unique to the world of art. In addition, encaustics have strong archival qualities for they do not require varnishing and are resistant to moisture and to yellowing.